Our Innovative Center Core chews are two taste and double the fun for every pet family. 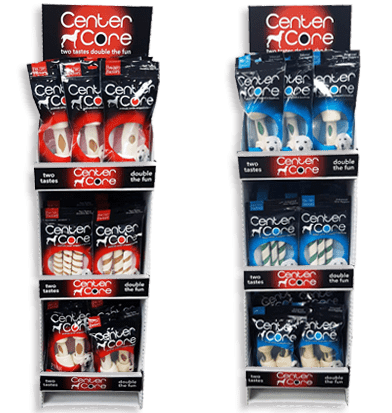 Center Core Chews consist of a fun and functional “Center Core” wrapped with 100% Made in USA rawhide. Your picks of healthy Dental Center Core or tasty Porkhide Center Core. These chews are manufactured under strict Global Food Safety Initiative standards to provide unsurpassed quality combined with full flavor. 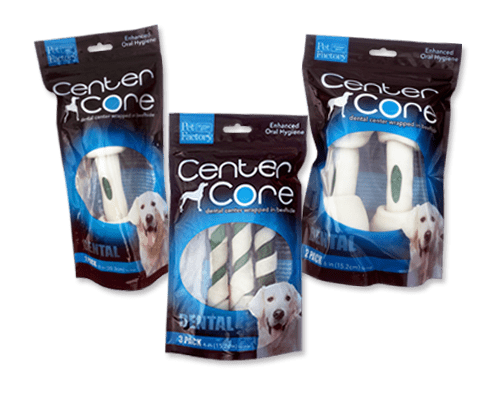 Center Core dental wrapped products are a tasty chew that helps clean your dog’s teeth while they chew.The dental core is infused with mint flavor and STAY-C®, a patent-protected form of vitamin C that hinders the formation of plaque which is formed by saliva and bacteria. These chews help promote great oral hygiene with use of STAY-C®, as vitamin C supports collagen production, a requirement for healthy gum tissue. Our trusted line of Pet Factory Center Core chews lets your dog know they deserve nothing but the best. Pet Factory Follows the strict Global Safety Initiative standards for food safety manufacturing. Pet Factory’s 100% American Beefhide chews provide unsurpassed quality combined with full flavor. Our 100% American Beefhide chews contain more and thicker fibers which results in longer lasting chews to satisfy your do. Available in Natural or a variety of flavors 100% American Beefhide chews provide pet parents with the satisfaction that they are providing the best possible chew for their pet. 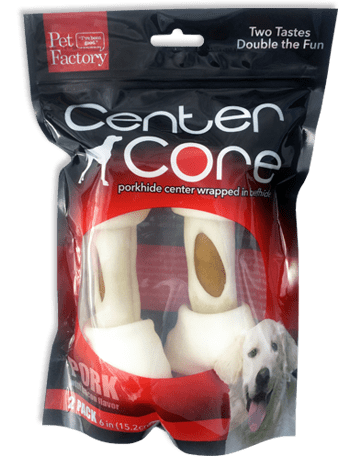 Center Core Pork wrapped products are a tasty chew dogs can’t resist. Made with 100% American Beefhide and 100% American Porkhide these premium ingredients provide two times the fun for every pet family. Our trusted line of Pet Factory Center Core chews lets your dog know they deserve nothing but the best. Our Pet Factory Center Core Chews are available in a premium printed stand up bags which is also re-sealable. Center Core products are currently available in two tasty flavors. The Dental Center Core wrapped in 100% USA Rawhide and the Pork Center Core wrapped in 100% USA Rawhide. We offer a 12” vertical display with attractive Center Core branding message included. 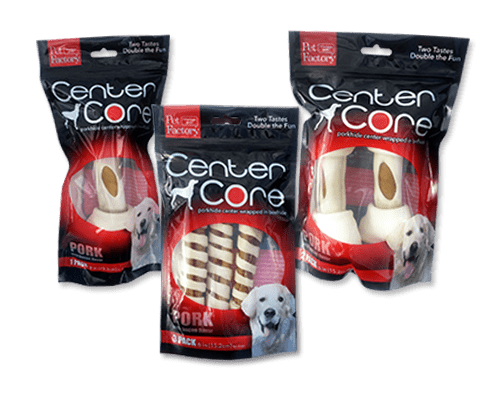 The Center Core line give your dog Two Taste and Double the Fun ! Not only will you know the difference, but your dog will taste the difference in every Pet Factory rawhide bone and chew you give them. These rawhide chews are processed in our Mundelein manufacturing facility using state-of-the-art technology and made only from premium beefhide from American raised cattle. What is so special about Pet Factory Center Core Beefhide Chews? The Pork Center Core items contain a tasty Center Core that is 100% Made in USA Pork roll which is wrapped in 100% Made in USA Beefhide. Our Dentail Center Core is infused with mint flavors STAY-C50 which is a form of Vitiam C.
Remember to replace your dog’s rawhide chew with another shape, flavor or type if and when they get bored or disinterested with the old chew. Looking for the Beefhide Chews for your Dog? American Beefhide follow the strict GFSI food quality standards, Pet Factory’s Premium American Beefhide chews provide unsurpassed quality combined with full flavor. Our Premium American Beefhide chews contain more and thicker fibers than any other rawhide dog chew. The result is a longer lasting chew with great American bred taste that will not only satisfy your pets, but also helps promote great oral hygiene by removing tartar and plaque.